Update: While I originally stated that this cap was from the later years of the Sun Rays history, I really should have also mentioned that 59Fifty tags didn't appear until 1994. This is important because while I've seen New Era use older, leftover tags on caps, this is the first clear example I've seen where they applied a 59Fifty tag from 1994 on a cap that was defunct by 1993. Either I've been wrong about the 59Fifty tag first appearing in 1994 or that they ran out of the 1992 tags at some point in the manufacturing process and had to use the ones from 1994 instead, which is so weird. Update (4/20/2019): This blog has been a learning experience for me over the years but sometimes new information comes to light so I've got to fall on my sword about something here. The previous update to this post mistakenly states that the 59Fifty tag first appeared in 1994 but I've seen caps from 1992 and 1993 that have it so there's that. 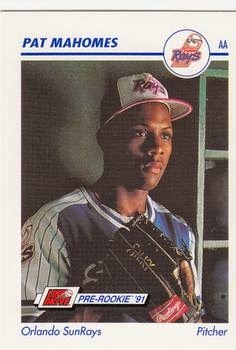 Because the SunRays only wore this cap in 1992, that has to be what year this cap is from. Friends, I have not worn a "fresh fitted" on a Friday in far too long, thus prompting my return to the game. I spent the winter collecting new fitted caps but I have been cycling through my old favorites for daily wear. I was doing some organizing the other day and I dusted off this little known headpiece from a stack of caps yet to be worn. While I usually try to have a theme to discuss regarding the caps featured here, this particular one of the defunct Orlando Sun Rays currently has very little significance in the online marketplace of vintage New Era caps. 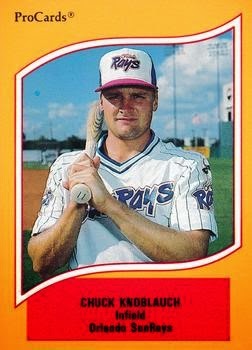 Come to think of it, I can't think of a single major leaguer who ever wore this style of the Sun Rays cap. My hope is by posting it here now may perhaps shine some light (oh, the puns) on a seldom-seen cap worn for a few seasons at most. 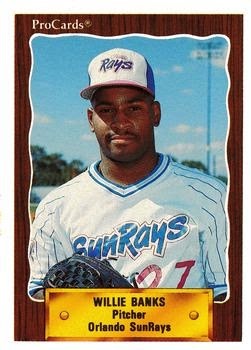 A little history on the Sun Rays is this long-time farm team for the Minnesota Twins was called the Orlando Twins from 1963 until 1989 and became known as the Sun Rays from 1990 through 1993 1992. Taking a glance at the inner and outer perimeter of the cap (as well as some old minor league cards in my collection) I can surmise that the cap is from the later years of the franchise. As I'm writing this, I'm starting to wonder why in fact this cap wasn't more popular. That sparkly and shiny "S" is classy in a way. If nothing else, at least it's unique. 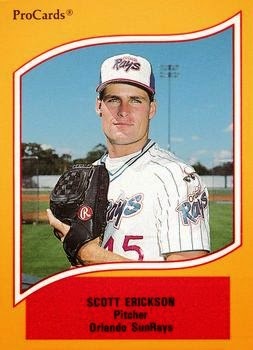 I think the early 1990's was when teams really started to subscribe to the notion that they needed to brand themselves differently from their major league affiliates. It seems like an obvious thing to say but every city and region in this country has some sort of significant "something" that sets it apart from elsewhere. While I wouldn't immediately think of Sun Rays when thinking of the city of Orlando, I like the moniker more than "Cubs" or "Twins" at least. One thing I'm not a big supporter of is the loose tags on the sweatband. I think that method of application was only around for a short while and all praise be unto New Era for shelling out the extra duckets for the extra thread on the current caps. Well actually I think that cost gets passed over to the consumer, but who'd know? So all in all, I'd say this cap is definitely worthy of being added into some sort of semi-regular rotation. Who knows, maybe someone from Orlando will call out to me one day and say, "Hey! Are you from the 'do?" and I'll be like, "Hell yes I'm from the 'do and you know I'm from the 'do because only people who aren't from the 'do call it 'Orlando', right?" to which he will reply, "heck yes!" Sadly, I'm not from the 'do.